Reese’s and Snickers and Twix! Oh my! Halloween candy is here! I went grocery shopping tonight, and I had to fight with every muscle in my body not to grab a bag of Candy Corn, my all-time favorite Halloween candy. One thing I love about this time of year is the seasonal baking display that our Wal-Mart sets up every year. It is stocked with cookie, cake, and pie-making goodness. I did give in and grab a mix for pumpkin muffins…yum! But I can use self-control eating muffins. Not so much with Candy Corn. One reason I’m glad I started my weight loss plan this summer is that I wanted to see some significant weight loss before the holidays. I have lost 12 pounds so far – woot! woot! – and I do not want to see all that hard work undone during the holidays. 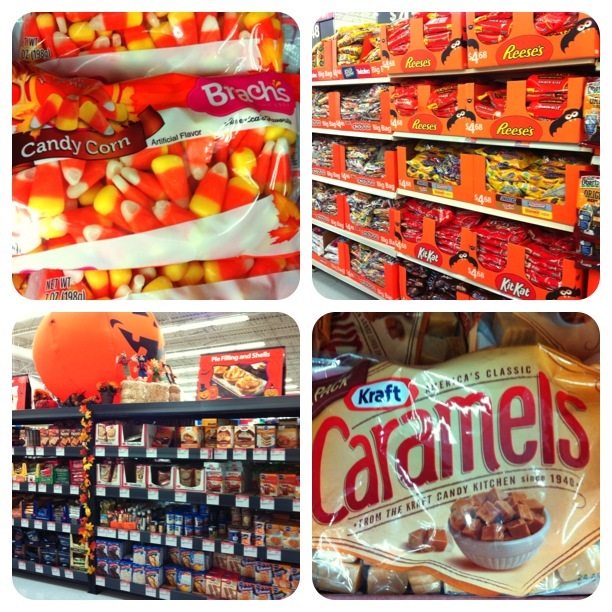 Thinking about those 12 pounds got me safely through the candy aisle today. Phew! And that is really amazing since I saw a big bag of the new White Chocolate Candy Corn M&M’s. I am so excited that tomorrow is the first day of fall! I am beyond ready for changing leaves, jackets, scarves, apple cider, pumpkins, mums, and all the cozy things that accompany the season. Happy Fall, everyone!